The ruling Congress-JDS coalition in Karnataka faces a litmus test as three Lok Sabha and two assembly constituencies go to bypolls Saturday, the outcome of which is expected to have a bearing on the state’s political scene. The ruling Congress-JD(S) coalition in Karnataka faces a litmus test as three Lok Sabha and two assembly constituencies go to bypolls today, the outcome of which is expected to have a bearing on the state’s political scene. The bypolls are for three Lok Sabha seats — Ballari, Shivamogga and Mandya — and for the Ramanagara and Jamkhandi assembly segments. 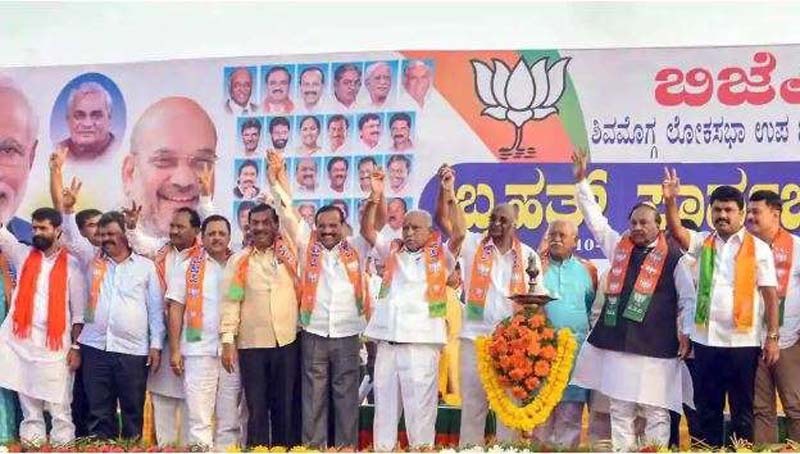 In a major embarrassment for the BJP, two days before the bypoll, its Ramanagara candidate against chief minister HD Kumaraswamy’s wife quit the contest on Thursday and returned to the Congress. Former chief minister and BJP state president BS Yeddyurappa casts vote in Shikaripura along with son BY Raghavendra, who is the party’s candidate from Shimoga. 101% my son (BS Raghavendra) is going to win Shimoga seat. We are also going to win Bellary and Jamkhandi. We will get absolute majority in all the constituencies: Former Karnataka CM and state BJP president BS Yeddyurappa.